Varèse Sarabande will release the BREATHE – Original Motion Picture Soundtrack digitally and CD on October 13, 2017. The album features original music composed by Nitin Sawhney (THE NAMESAKE, TV’s HUMAN PLANET). For his directorial debut, Andy Serkis brings to life the inspiring true love story between Robin and Diana Cavendish (Academy Award® nominee Andrew Garfield, Golden Globe® winner Claire Foy), an adventurous couple who refuse to give up in the face of a devastating disease. After a fairytale-like courtship, Robin is struck down by polio at the age of 28, confined to a hospital bed and given only a few months to live. With the help of Diana’s twin brothers (Tom Hollander) and the groundbreaking ideas of inventor Teddy Hall (Hugh Bonneville), Robin and Diana dare to escape the hospital ward to seek out a full and passionate life together — raising their young son, traveling and devoting their lives to helping other polio patients. 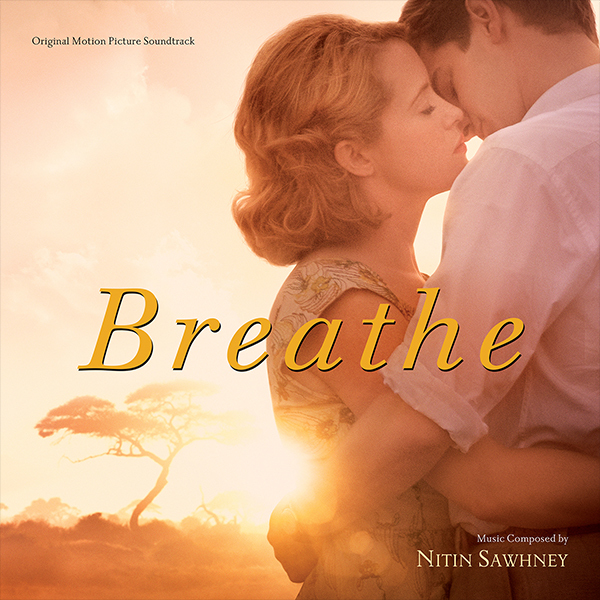 Written by two-time Academy Award nominated writer William Nicholson, and shot by three-time Academy Award winner Robert Richardson, Breathe is a heartwarming celebration of love and human possibility. The filmmakers chose composer, songwriter, and multi-instrumentalist Nitin Sawhney to create a musical background that reflects the Cavendishes’ spirit of adventure and resilience against the odds. Celebratory, upbeat, poignant and romantic, the score uses primarily orchestral instruments with some added soundscapes and elements of jazz improvisation. Composer Nitin Sawhney is an artist, producer, songwriter, club DJ, broadcaster, multi-instrumentalist, orchestral composer and cultural tastemaker. Sawhney’s Lifetime Achievement recognition at the Ivor Novello Awards honor his work across albums, theatre, television, dance, videogames, clubs, production, films, etc. With some 50 movie scores to his name already, his upcoming projects include the music for the new big-screen 3D adaptation of Rudyard Kipling’s beloved classic The Jungle Book, also directed by Andy Serkis. The film, which blends live action and performance capture, has a star-studded cast led by Christian Bale, Cate Blanchett and Benedict Cumberbatch. Bleecker Street/Participant Media present BREATHE in theaters on October 13, 2017. Varèse Sarabande will release the BREATHE – Original Motion Picture Soundtrack digitally and CD on October 13, 2017.